JOLIET – The Illinois Board of Higher Education has approved a fiscal year 2020 budget that would include $314 million new dollars, or a 16.6 percent increase in funding, for higher education operations in Illinois. “This next fiscal year is beyond critical for the future of higher education in our state,” said Tom Cross, chairman, IBHE. “The board believes that a $2.208 billion budget request will mean reinvestment in higher education, and a commitment to ending the pattern of outmigration of Illinois students.” The board action was taken Tues, Dec. 4. “For the public universities, we feel that a ten percent increase, or $110 million in additional revenue, is reasonable and will allow those institutions to start to heal after 16 years of budgets below the benchmark of fiscal year 2002,” explained Cross. 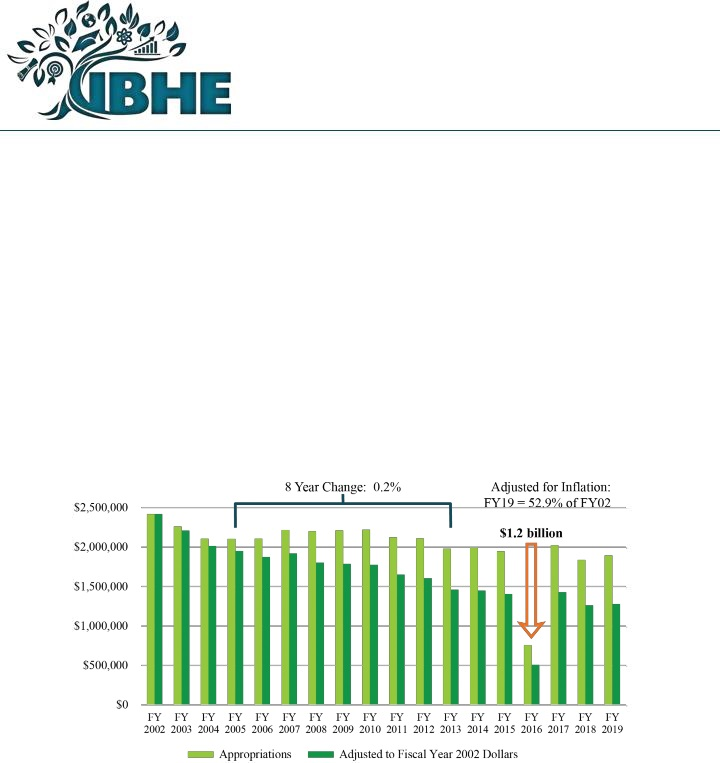 “Universities still haven’t come close to recovering from the worst blow, which was the stopgap budget of fiscal 2016.” The chart above shows the appropriations for higher education as adjusted for unfunded mandates and inflation. “It’s important to note that even with a 16.6 percent increase, next year’s budget would still be lower than the $2.417 billion amount approved by lawmakers for fiscal year 2002,” said Cross. The board is also requesting $664 million in Capital Renewal funding to pay for imperative deferred maintenance. That is in addition to $1.5 billion that is necessary for regular capital projects.